A big THANK YOU to everyone who participated in the Cibolo Creek Brewing 5k Beer Run! We had a blast and hope you did too. Pictures are up on our Facebook Page now! Just click HERE to view them. The Cibolo Creek Brewing 5k Beer Run is the fourth event in the Texas Beer Series. Opened in 2016, Cibolo Creek Brewing Company offers great food and craft beer located right in the heart of Boerne, TX. This fun and social 5k beer run will be hosted at Cibolo Creek Brewing’s taproom and brewery at 448 S Main St, Boerne, TX 78006. Packet pickup starts at 2pm and the run begins at 4pm on Saturday, September 23rd, 2017. 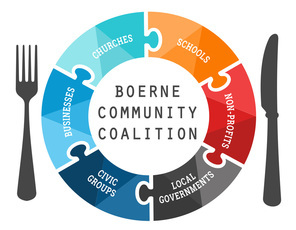 A donation towards Boerne Community Coalition; Cibolo Creek Brewing’s chosen charity! Registration is only $45! We are ordering extra shirts, however participants who sign up after September 11th aren’t guaranteed a shirt. 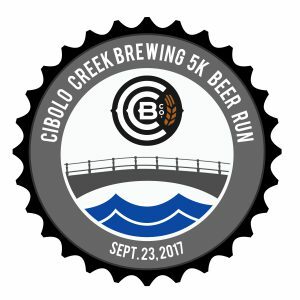 The Cibolo Creek Brewing 5k Beer Run is a unique event You don’t have to wait until the end of the 5k to enjoy Cibolo Creek Brewing’s great beer; we will have samples for you throughout the race! Everyone will get to enjoy their first sample of beer right away, because we will begin the race with a celebratory “cheers!”. This 5k course is a five lap, 0.62 mile loop around the brewery. After each lap, you will get another sample of AMAZING Cibolo Creek Brewing craft beer! When you finish the 5k you will receive a souvenir pint glass as your finisher’s award. Pint glasses are our favorite kind of finisher’s medal! Packet pick up will be onsite at Cibolo Creek Brewing’s taproom and brewery from 2pm-3:45pm on race day, Saturday September 23rd, 2017. Come out early to get a good parking spot and enjoy a pint before the run. The 5k run will start at 4pm. Cibolo Creek Brewing has chosen the Boerne Community Coalition as their charity partner for the Cibolo Creek Brewing 5k Beer Run!